A regular reader asked about table-top lighting. It inspired me to think about table-top studios. A subject I really enjoy. I am going to post on various aspects of the subject, including lighting. To start us off here are some ideas. 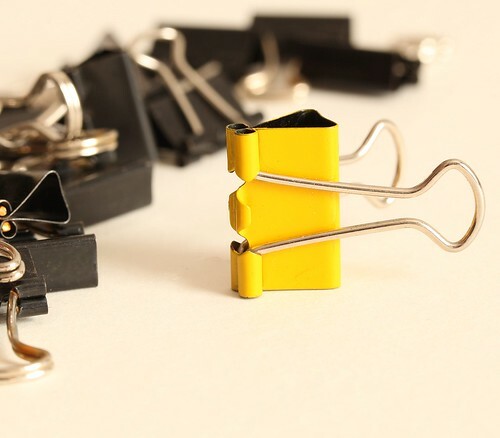 In the UK we call the clips in the picture “Bulldog clips”. I am not sure why. Elsewhere they are often called binder clips. They have a very strong spring steel body and “handbag” handles that can be folded back or down flat. They are pretty useful for clipping paper together. No table-top photographer should be without them either. I have three different sizes which I use to hold reflectors. They are clipped onto the edges of white-board. Then they can hold the board in an upright position creating the table top reflector or white back-screen. The clips act as stands for small desktop reflectors to spread the light around. Reflectors are very important for table-top photography. As the objects you are photographing don’t move you can use low levels of light. Typically people use window light. However, using white-board reflectors you can spread the light around the back of objects and get a more even light. Controlling light that is reflected is better than adding other artificial lights. It is reflected in proportion to the original light source and therefore does not look out of place. In the picture I show three clips holding up a white card. For a small board like this one you can get away with only the two side clips. Then you can remove the middle clip allowing the board to be used as a white screen (as I did with the torch shot below). With a bigger board you can add more clips. Alternately, for bigger boards you can use the clips to hold the board to other more substantial supports. I have used binder clips for positioning many different things for table-top studies. They are easy to use and inexpensive. You can buy them in most stationery stores. I have about 10 of each size. In the shot above I used the large size for demonstration purposes. The smaller ones would have been fine for this particular board and would have been less obtrusive in the photograph. Photographic lights on a table-top can be over-kill. On-camera flash is very bright and harsh too. I tend to use window light or flashlights for supplementary light. Older flashlights with bulbs give off a very yellow colour cast light. Modern LED lights are better, they tend to have a whiter light. Unfortunately single-LED flashlights tend to give off a very hard light. It is harsh and often has rings of light from the shape of the internal reflector. There are two ways to even out the light from a flashlight. Point it at the card reflector instead of the subject and use the reflected light. The other way is to use a piece of white toilet tissue as a diffuser. 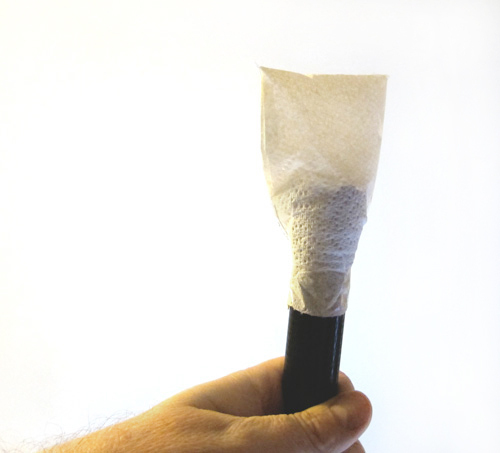 Make the tissue into a dome over the light – make it loose and wide so the light is spread. You can fix it in place to the flashlight with sticky tape or an elastic band. The sides of the tissue have been sealed with a little slip of sticky tape. The tissue is held in place with a tight wrap of sticky tape around the flashlight. There are a wide variety of different flashlights you can use. 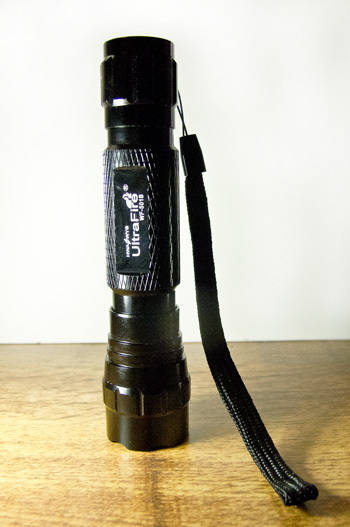 The one shown is the ULTRAFIRE WF-501B NOW WITH CREE XM-L U2 LED UPGRADE FROM CREE T6 LED -1000 LUMEN FLASHLIGHT/TORCH . It is a relatively inexpensive purchase. However, the batteries are non-standard size. You will need to purchase the CHARGER for 18650 14500 +2x 18650 3.7V 3000mAh Li Rechargeable Battery as well. You get two batteries with the charger. You will also need to buy the charger & battery set too. These flashlights are very powerful. I definitely recommend them. I have three of them for table-top lighting. They are also excellent for light painting at night – but that is another story. For an even more diffused source I use a multi-LED flashlight. The Rolson 61770 72 LED Camping Light can be purchased at a great price too. The Rolson 61770 72 LED Camping Light provides a wider more diffuse light. As with the torches, you can diffuse the light even more using the tissue trick if you want. These are also highly recommended for table-top photography. The light is great for all sorts of photography and it can also be reflected. Table-top lighting is a pretty simple business and inexpensive too. Using white card reflectors helps to spread light around. It is best to work with window light if you can. However, you can also work with low intensity artificial lights. I use hand-held flashlights. They are really flexible and the light is easily manipulated using white card reflectors. Good one, Damon. As always, thanks for some new hints. Glad you enjoyed it. I will be doing some more on home studio and home lighting soon.